Until recently, insulating solid walls has been expensive with a dubious payback. As a result, the insulation industry has traditionally focused on the low hanging fruits of loft and cavity wall insulation, which are typically cheaper, resulting in a quicker payback for the home owner. There is little ‘low hanging fruit’ left; all the easily accessible loft and cavity wall installations have been completed after many years of free offers to home owners paid for through the CERT scheme imposed on the energy companies. The shift in policy focus towards subsidising the insulation of “hard to heat homes” through the ECO (Energy Company Obligation), which is a similar scheme to the old CERT but with an emphasis on solid wall insulation. Approximately 7.9 million homes in Great Britain are estimated to have solid walls. Of those, approximately 144,000 have had insulation fitted, representing roughly 2% of those that could be fitted. It is estimated that at the start of July 2012 there were 7.7 million uninsulated solid wall domestic properties (97 per cent of homes with solid walls). Government schemes to date have focused on insulating homes with cavity walls due to the higher costs associated with insulating solid wall properties which accounts for the very low uptake. Of the remaining potential it may not be possible to insulate all solid wall properties as it is likely that some of these will be too costly to treat or be within in conservation areas and will therefore never be insulated. However, this still leaves a great many properties waiting to be treated. There are approximately 3.13 million hard to treat cavity wall properties in the U.K. These include properties which have walls with cavities which are unfillable. These are properties which have a timber frame wall type with both a studwork cavity and a masonry cavity. In this wall type the studwork cavity contains insulation and the masonry cavity does not contain insulation. These walls are frequently treated with solid wall insulation as a solution. Current building regulations require a target U-value of 0.35 W/m².K to be reached if any modification to the wall such as insulation is made. It is likely that solid wall insulation installations carried out before 2002 (i.e. before the first phase of the Energy Efficiency Commitment) may not achieve this level of thermal performance, so these are not recorded in these statistics. In summary, the size of the current solid wall insulation market is in the region of 8 to 10.5 million homes. These homes are typically concentrated in more urban areas, especially those cities that experienced population booms at the end of the 19th and beginning of the 20th centuries. The other main concentration is around cities that experienced major bomb damage during the World Wars and then saw post war growth. Many of the homes build after the 2nd World War were system built with no cavity, and little attention was paid to the thermal performance of the buildings. 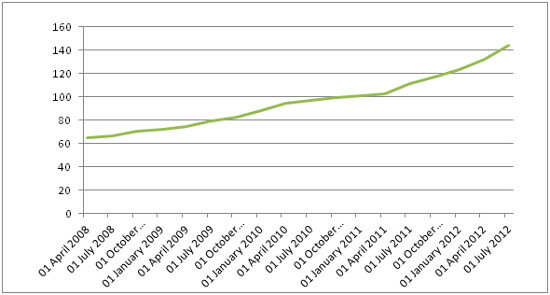 The number of properties with solid wall insulation increased by 22% between January 2011 and January 2012; an increase of approximately 22,000 properties. The source of the increase in these numbers has been the CERT (Carbon Emission Reduction Target) and CESP (Community Energy Saving Programme), which accounted for 51,000 and 27,000 solid wall insulation installations respectively. In the last quarter alone 4,000 solid wall insulation installations took place, twice as many as the number installed in the same quarter last year. With the introduction of the Green Deal and the ECO, schemes specifically focused on tackling solid wall insulation, uptake is expected to increase even further. It is estimated that the UK insulation industry is worth approximately £700 million and employs around 35,000 people. There is going to be a decline in the cavity and loft insulation sectors, partly because all the willing customers have already had the work carried out for free, and also because the incentives are being shifted to solid wall insulation. These predictions have been passed on there being a gap between the existing schemes and the new Green Deal and ECO being implemented – this gap has to a large degree been filled, however there will need to be a change in the focus for the labour market from loft and cavity to solid wall insulation. CITB-ConstructionSkills has been working with industry including Federation of Plastering and Drywall Contractors (FPDC), The Insulated Render and Cladding Association (INCA) and National Insulation Association (NIA) to try and reach as many contractors as possible who may need up skilling to make the shift from cavity and loft to solid wall insulation. As described above, there are two key schemes that are being introduced to stimulate the insulation market – the Green Deal and Energy Company Obligation (ECO). They have carbon emission reductions at their heart, however these targets translate to meaningful subsidies for home owners to act. While it is expected that the ECO scheme will launch on 1 January 2013, it is also expected that energy suppliers will be allowed to retrospectively score ECO activity from 1 October onwards towards their eventual ECO targets. The target for the ECO has been defined as 0.52 MtCO2/yr by 2015 (equivalent to 1.95 MtCO2/yr in 2022 pro-rata). This translates into an affordable warmth target of “a £3.4 billion reduction in lifetime costs of heating for low income and vulnerable households by 2015”. In simple terms, this means that energy suppliers will need to invest approximately £1.3bn per year through the ECO. The Government has indicated that it sees the ECO as a long term (10 years or more) scheme and claims that it will be set at a “consistently ambitious level over this period”. The initial ECO period will be 2.5 years and energy companies will be allowed to decide the speed at which they deliver the ECO. The expectation is that there will be a slow start as the solid wall industry grows and is more able to meet the increasing demand. The government has also suggested that as the industry develops that the cost profile of the industry will develop and market innovation, learning, and economies of scale will bring costs down. 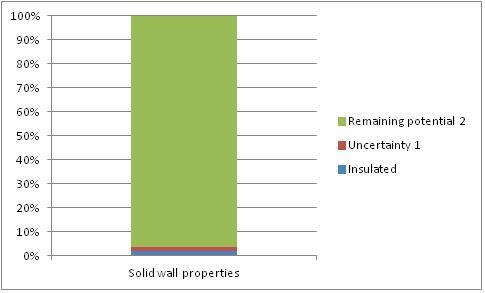 DECC have published estimates that they expect 380,000 homes to be fitted with solid wall insulation by March 2015, reaching 1.5 million homes by 2022. These figures have been amended from 515,000 homes (to be achieved in 3 years). In terms of a breakdown of spending for different schemes within the ECO, 25% is expected to be directed towards the Affordable Warmth target and 75% towards meeting the Carbon Saving Obligation and Carbon Saving Communities Obligation. This means that up to ¾ of the funds available may be available for solid wall measures. DECC is using two main promotional activities to launch and generate interest in their schemes. Firstly there is the Green Deal Cashback Scheme available from 28 January 2013 for households in England and Wales. This gives upfront cash incentives to households taking up a selected list of Green Deal measures. The scheme pays £650 for solid wall insulation; the next highest offer is £390 for flat roof insulation. A minimum of 50% of external walls must be insulated to qualify for a Cashback and the work must be done within the specified period – 6 months for solid wall insulation. The second promotional activity announced is a lift on their marketing freeze to promote the launch of the Green Deal and ECO. They have committed to a £2.9 million marketing budget to raise customer awareness of the schemes. While some sectors of the domestic insulation industry are likely to stagnate, it is highly likely that there will be steady growth in the solid wall sector in the next 12 months. This growth will increase as the energy suppliers start to deliver the ECO more aggressively and the expected economies of scale start to emerge. Be Energy Smart are interested in hearing from any companies that fit solid wall insulation or are planning to move into the sector, as we currently have leads available to buy for qualified companies. We expect the number of leads that we receive to grow throughout 2013 as consumer awareness grows, so why not register with us today to take a look at what we have available? This entry was posted in Energy Solutions and tagged Market trends, Solaid Wall Insulation. Bookmark the permalink.